• price for individual lesson 18 EUR / 55 min. It’s hard to say what makes a drummer and pianist return to the accordion, but still, my musical “trips” enabled me to get myself acquainted with other instruments. My teaching is therefore guided by the idea that there’s only one music and it doesn’t matter on which instrument you play it. I studied the button accordion (B-Griff) at the musical coservatory in Brno and currently I play the piano accordion, so I teach both systems. And I also used to play the helicon accordion in my younger years – why not add that as well? 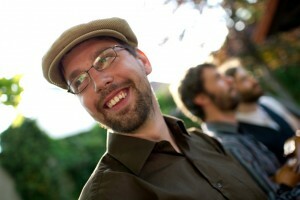 I enjoy variety in life as well as in music, therefore I play all genres possible, be it Czech, Moravian, Austrian or Irish folk songs, jazz, Balkan music, musette Argentinian tango, or even pop and rock, and I’m ready to teach you any of these and help you adapt any song or composition you’d like to learn. Thanks to my conservatory studies, I’m also able to help you with technically more advanced playing. • consultations 400 CZK / 60 min., regular lessons 350 CZK / 60 min. I am a graduate of a classical music conservatory, which has provided me with technical skills and the knowledge of notation. Although these are useful tools, they aren’t everything. What is most intriguing about music is the happiness that transfers from the player to the listener and then back again; it’s this exchange of emotions that I like most. I aim for it while playing and teach it to my students: to awaken their happy feelings and spontaneity, but also diligence and strong will. The result depends as much on the process as on the character you give to it. I work with my students individually, depending on their needs, taste and talent (visual – using scores, auditory – using hearing). It’s possible to make your first musical steps with me, or focus on more demanding technical skills. Looking forward to meet you! • price for individual lesson 500 Kč / 45 min. How does it happen that a biologist becomes a musician? What strange evolutionary mechanism could have caused such phenomenon? I’m not quite sure, but it did happen. Maybe you have to spend 10 years playing the accordion and teaching others, and not once during that time consult a botanical to find out the Latin name of some flower. I focus primarily on the teaching of adults, beginners as well as advanced players. I teach them that playing a musical instrument is a joy as well as a bit of hard work, and I teach my accordionists to be independent. I like singing and accompanying myself on the accordion, so it is through songs I teach my pupils play, listen and feel music. However, I don’t avoid instrumental music. I encourage my pupils to play with others: it’s something completely different, one has much larger motivation to exercise. It’s not easy to find someone to play with, but it’s worth the time. And what’s best about playing? Don’t let yourself be limited with scores and make up, compose, your own music. It’s nothing diffilcult, you can begin with a simple melody. Play with the notes, chords, rthythms, and soon you’ll have your own piece in your hands. • price for individual lesson 400 CZK / 60 min. The accordion (or squeezebox, as you wish) has brought me lots of musical, but also other experience during my life. This instrument isn’t just about music. It’s an instrument that entertains, brings enjoyment and makes friends. 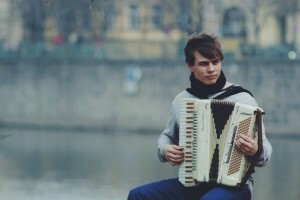 You can hear great music played with accordion all over the world. 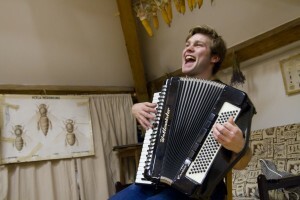 Currently, I study piano accordion play at the Jaroslav Ježek Conservatory. 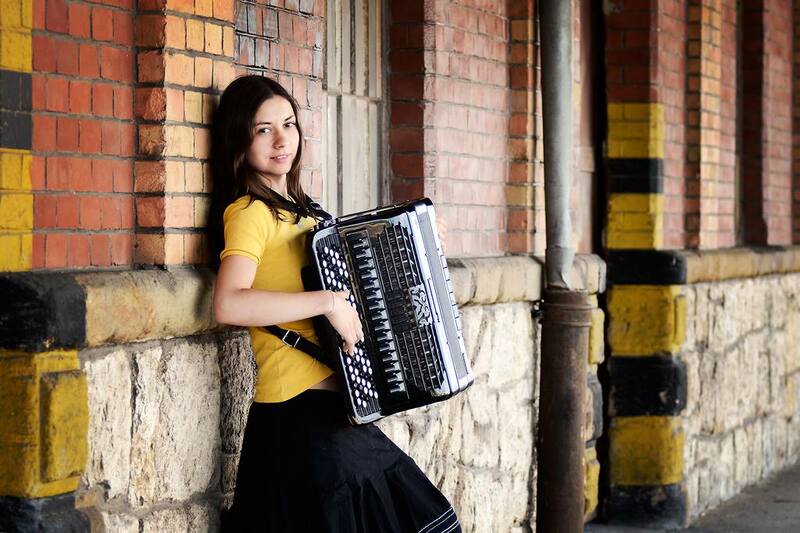 Thanks to the fact that accordion fits in well and is necessary almost in any sort of music, I get in contact with classical music, jazz, French mussette, folk or popular music as well as klezmer. Scores can be a great support and they often save the performance, if the player’s memory fails. However, you can’t rely just on them. The possibility to play a song according to a melody in your head can extend your repertoire to many hours. In teaching, I therefore promote the understanding of scores, but my learners still have to maintain their musicality and use not only their hands and eyes, but also ears while playing. And I’m not just an accordionist – my another musical instrument is the tuba, in my opinion the best combination of instruments possible! Have you chosen your teacher? Write us! Do you want more info about our accordionists’ school?